For us it started on February 2007, after this power-house voice took over the audition process on the US singing competition of American Idol. Her name: Melinda Doolittle, a shy and very scared backup singer who just happened to audition that year after her friends convinced her to do so. But there are no coincidences in life, Melinda was destined to be more, and we saw that. Her incredible singing voice and humble spirit won our hearts and the heart of the hardest judge of all, Simon Cowell, who called her "little tiger" after one of her most memorable performances. The fans following her every step each week adopted the name of Melinda's Backups™, as she was now at the front of the stage and a front runner too and we were backing her up. As a gift during the competition, and following Simon's remark, Melinda's Backups™ sent her a stuffed Tiger. “We knew the Tiger had arrived at the studios, but did not know whether Melinda had received it personally”. However, on Melinda's homecoming trip in May, pictures emerged of her and the Tiger. Melinda subsequently revealed that the little Tiger accompanied her on the tour bus (for the 2007 summer post Idol tour) in her sleeping compartment. The tiger is now a meaningful symbol for Melinda's Backups™. During the AI Live Tour, Melinda's Backups™ set on a mission to send Melinda flowers at every American Idol Live Tour concert. (She kindly took pictures and posted them on her myspace. We also show these pictures in our Community.) What made this effort even more meaningful was the donation of bed nets to help fight malaria, along with the flowers. Melinda is an active supporter of this cause through Malaria No More (see Melinda in Africa). As a show of support for Melinda and this wonderful charity, Melinda's Backups™ have spearheaded efforts to encourage others to do the same. Thousands of dollars have been donated to Malaria No More on behalf of Melinda Doolittle to save thousands of lives from this deadly disease. Melinda Doolittle has gained fans from over 30 countries. And this is only the beginning. Melinda's Backups™ will be backing her up through her promising music career and humanitarian efforts. "I love you! I love you! I love you! You all have to be the most amazing people on the entire planet! I have never experienced so many wonderful people all at the same time. Every time I log onto the Internet, I see something special the Backups have done, said, planned... you name it. I could not ask for better representation. You all represent God well, which represents me well. I just pray that I continue to represent you all well. Thank you for staying above board on all the crazy topics that go on out there in blogs and posts and stuff like that. I feel so honored to have such an amazing backbone out there supporting me. I just want you guys to know that none of it goes unnoticed...and although I can't respond to each of you like I want to right now, know that I pray for you daily and I am sooooo grateful. Thank you all!!! Did I mention...I love you?" As the American Idol tour drew to a close, the curtain was poised to rise on the next chapter of Melinda’s career – and the Backups were proud to be there every step of the way. It has been our pleasure to support Melinda in her musical aspirations and to watch as her career continues to flourish. Melinda’s talent and dedication took center stage in her first solo concert this past fall, held in Franklin, Tennessee in November of 2007. Held at the Boiler Room, the hour and a half long concert featured full length performances of songs that Melinda sang on Idol, as well as a skit and a stunning rendition of Amazing Grace. What a way to come full circle for this year of new beginnings … I had to come on here and just say thank you guys so much! I loved every bit of the experience! Thank you for making last night a night I will always remember. As the year drew to a close and the 2007 holiday season quickly approached, the Backups wanted to do something to acknowledge Melinda’s ongoing dedication to and kindness towards us. After careful consideration and deliberation, we decided on a project which we hoped would show Melinda not only how much we admire her as an artist, but as a person. Melinda has spent a countless amount of time working to make this world a better place. Her genuine desire to help others has been a true inspiration, and we wanted her Christmas gift to reflect that. Along with an engraved glass ornament, the Melinda's Backups™ decided to give Melinda another very special gift, a gift to show her how her own selfless acts have inspired us to give back as well, to give of ourselves in an effort to help those who need it the most. Melinda’s own charitable work and her kindness have reminded the Backups that it’s time to think not only with our heads, but with our hearts. She has shown us that together we can make a difference … and together we will make a difference. To that end, the Backups wanted Melinda’s holiday gift to reflect that sense of giving and of helping others. The Backups who participated in this part of the gift pledged to volunteer their time working for a charity in their local communities, thus bringing the spirit of the season home to many different cities not only throughout the country, but throughout the world. The Backups’ volunteering efforts took many forms, including but not limited to: donating to the Salvation Army; preparing food for a local Ronald McDonald house; donating holiday gifts to a family from a local church; participating in an Angel Tree project and purchasing gifts for children in need; working with the Meals on Wheels association to deliver food to deserving families; donating to the Make-A-Wish Foundation; and working with the Adopt-A-Family program. The participating Backups wrote letters to Melinda explaining their charitable endeavors and how she had been the one to inspire them to help others at this most special time of year. These letters were compiled into a scrapbook which was delivered to Melinda, along with the ornament, before the last show of her 2007 Christmas tour with Michael W. Smith. It truly was an honor for the Backups to be able to give back to Melinda in such a special way, to thank her for all she has done not only for us, but for so many people around the world. To say that we were all deeply touched by Melinda’s response, posted below, would be an understatement. First of all, I cannot say thank you enough for making the best year of my life. I never imagined something like this would happen and that I would get the chance to share it with such amazing people. I actually had no idea that at the end of this year, I would be sitting here wondering how it happened that I fell head over heels in love with a group of people. I didn't even know that was possible. I knew you guys were light years beyond any other fan club (by the way, we need to come up with a different name than that, because that does not do you all justice), but I am absolutely amazed at your ability to still surprise me with your ideas and your hearts. This Christmas is no exception … as a matter of fact, it proves my point that you all are angels sent from up above. I cannot get over the Christmas gifts you all gave to me. The IPod Touch is amazing! I love the messages on there. That was an awesome idea. It makes me not want to add any songs and just listen to you sweethearts the whole time. The star was beautiful. We might be here all day if I named everything, but thank you, thank you, thank you. Now on to the real kicker … the scrapbook with the stories of how you all changed lives this Christmas. I read every single one and just kept on crying. I don't know if you remember Oprah's "Wildest Dreams" segment last year, but it was a time where she made people's dreams come true. I remember watching that and crying out of joy every time someone got what they really needed or wanted. Well, I prayed right then and there for God to give me the resources to begin to make people's dreams come true and to really touch lives. When I prayed, I was thinking I was praying for finances … little did I know, I was actually praying for people like you to be my hands and my heart to people that really needed it. That is such a huge honor! I could not have asked for a better gift. You have no idea how much that touched me. So, thank you for being an answer to prayer, thank you for loving on me when I needed it most and thank you for showing me that absolutely nothing is impossible with God. I love you so much!!! Inspired by Melinda’s continued support of the Malaria No More charity and her dedication to making this world a better place, the Backups banded together to participate in the Nashville Country Music Marathon in April 2008. One of Melinda’s Backups™, Sara, came up with the idea and encouraged a team of runners to join her in Nashville. As momentum grew, those who were unable to run joined the cheerleading squad and both groups put a countless amount of time and effort into raising money for the very worthy cause. The marathon participants began training five months before the race, working hard to prepare for either the half or full marathon in which they chose to take part. The group of runners and cheerleaders supported each other daily, sharing training advice and schedules, information about participating in the marathon, and words of both inspiration and motivation. The training process was extensive and sometimes demanding, but the Backups, both those participating in the marathon and those who acted as cheerleaders, all served to encourage and support one another. Through both sponsorships and donations collected, the Backups team was able to raise over $9000 for Malaria No More, as well as to raise awareness of the charity and the very important work that it does. While serving primarily as a means of supporting Melinda and raising money for a charity close to her heart, participating in the marathon also afforded many of the Backups the opportunity to join together and spend time with one another in person. It has been said quite frequently that the Backups aren’t simply a group of fans, but rather a family … and joining together in Nashville was like coming home to a most special family, one filled with so much heart. Melinda herself is such a very important and special part of the Backups family, and it was a joy to have her join us in Nashville for the event. Moved by the Backups’ determination and diligence, Melinda made it a priority to be in Tennessee to cheer on her supporters, arriving in Nashville the night before the race and joining both the runners and the cheerleaders for their pre-race dinner. She presented each participant with a token of her appreciation, thanking everyone for “going the extra mile.” The truly special gathering served as a source of inspiration for all the Backups and is an experience that will be treasured forever. In addition to spending time with the Backups the night before the marathon, Melinda proudly stood on the streets of Nashville during Saturday’s race, cheering on the runners and serving as a source of encouragement for them all. It was time to set sail for many of the Backups when they had the chance to join Melinda, as well as fellow performers Michael W. Smith, Amy Grant, and the Sheasby’s, on an eight-day long cruise in July 2008. Designed to both spotlight the singers’ talents and give them the opportunity to interact with their fans, the cruise was a wonderful opportunity for the Backups to once again show our support for Melinda. The cruise kicked off with a “Welcome Aboard” concert, featuring four songs by Melinda. The talented singer also performed during three additional concerts, including one where she had the opportunity to sing eight songs, much to the delight of the Backups. However, the cruise didn’t just feature concerts; it also gave the Backups the chance to spend quality time with Melinda. Activities like air hockey and a dance party brought about not only fun and laughter, but also the chance for Melinda and the Backups to enjoy each other’s company. The activities didn’t end on the cruise ship itself … passengers had the opportunity to enjoy places like Cozumel, Grand Cayman, and Jamaica. Excursions off the cruise ship also proved to be an exciting way for the Backups to further bond not only with Melinda, but with each other, as well. For the Backups lucky enough to be aboard for this journey of a lifetime, it was a truly meaningful experience to treasure always. One of Melinda’s Backups, Holly, summed up the special trip and the feelings of all the Backups who attended. Although the Backups had to say “bon voyage” to the cruise at the end of the eight days, there was another exciting event on the horizon: the Music Jam in Nashville, TN. Held on August 31st, 2008, the event featured performances by a myriad of singers, including Melinda. Always happy for an opportunity to spend time together while supporting Melinda, many of the Backups decided to make the trip to Nashville for the event. They came by plane and they came by car, and everyone had an unforgettable and incredibly special weekend. Many of the Backups went to Nashville several days in advance of the concert, taking advantage of the time to catch up with old friends and to meet new ones. After spending several days enjoying everyone’s company, the Backups were beyond excited to see Melinda perform on the 31st. Always known for their enthusiasm, the Backups were first in line, happy to arrive early and show their never-ending support for Melinda! Their devotion was made clear to everyone attending, excited smiles on the Backups’ faces as they were in the front row for the concert! The Backups were thrilled to cheer for Melinda as she performed her songs, including several from her upcoming debut album. Following the concert, Melinda joined the Backups for a special dinner, demonstrating yet again that she doesn’t treat her supporters as fans, but rather like friends and family. Not only did the talented performer spend time with the Backups after her concert, but during the next day, as well. This weekend was proof yet again not only of how far above and beyond Melinda always goes for the Backups, but also of how she makes the experience truly meaningful for everyone involved. Jena, one of Melinda’s Backups who met the singer for the first time at Music Jam, expressed her thoughts, perfectly explaining not only how special Melinda is, but how special a group of people the Backups are. It has been a joy for the Backups to support Melinda in both her musical aspirations and her charitable endeavors. We are so grateful to Melinda for all she has done for us, for always taking the time to go above and beyond … and the feeling is mutual. Both Melinda herself and her best friend Kelley spoke about the Backups, enthusiasm in their voices as they discussed the extraordinary relationship between Melinda and her supporters. “We love the Backups! You guys are amazing! You’re the best!” Kelley said, a bright smile on her face. Melinda agreed, genuine emotion in her voice as she talked about the very special bond between herself and her Backups. “I’ve never known a whole group to get someone’s heart so well,” she said earnestly. 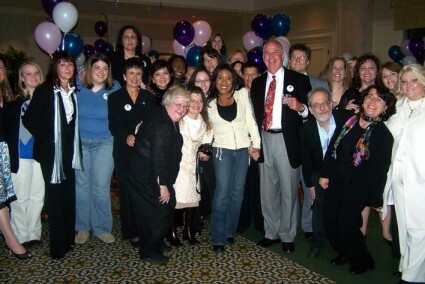 In 2009 Melinda’s Backups™ became the official fan group for Melinda Doolittle!